Juventus play SPAL away knowing a win or even a draw seals an eighth consecutive Italian Serie A title for the Turin based club. It has been total ascendency by Bianconeri in Italy over the past many years with no club even coming close to providing a fight. With a massive game with Ajax at home on Wednesday, Juventus can do away with the distractions of the Scudetto at the earliest. Opponents SPAL are 16th in the league and battling the drop. A defeat at home could see them inching towards the relegation zone. Leicester City 0 - 1 Newcastle United: Ayoze Perez Heads Newcastle Closer to Premier League Safety. SPAL have been hit by injuries to Mattia Valoti, Jasmin Kutic, and Vasco Regini and the trio could miss the encounter with Juventus. Felipe in central defence will be involved in a fiery duel with Juventus forward Moise Kean. It will be interesting to see who comes out on top of this battle. Skipper Micro Antenucci is the hosts major hope for a goal and the Italian was on target in their defeat against Cagliari. Emiliano Viviano can expect a busy game between the sticks as is the case when you play against the strongest teams in Italy. 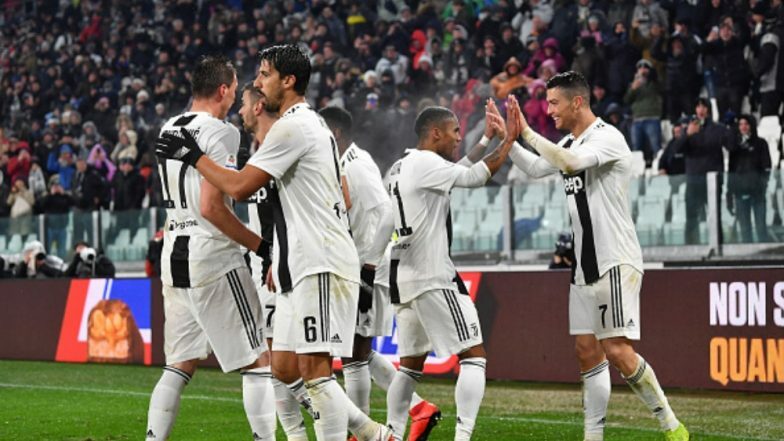 Majority of the first team players like Cristiano Ronaldo, Mirlaem Pjanic, Mario Mandzukic, Blaise Matuidi and Douglas Costa will not feature considering the impending game against Ajax. Mattia Perin will replace first-choice goalkeeper Wojciech Szczesny in the starting eleven while Mattia De Sciglio should also feature. Moise Kean has been scoring goals for fun in the league and it will not be a surprise if he finds the back of the net again. Leicester City Appoints Brendan Rodgers as Foxes' New Manager on Three-Year Deal. When is SPAL vs Juventus, Italian Serie A 2018–19 Football Match Schedule (Date, Time and Venue Details)? SPAL will take on Juventus in Italian Serie A 2018-19 season on April 13, Saturday. The game will be played at the Stadio Paolo Mazza and the start time is scheduled at 06:30 PM (IST). How to Watch Live Telecast of SPAL vs Juventus, Italian Serie A 2018–19 Football Match? Sony Sports Network is the official broadcaster for Italian Serie A (2018-19 season) in India. The fans can see the live match telecast on Sony Ten 1 channel to see SPAL vs Juventus match on their TV sets. Where to Get Free Live Streaming Online of SPAL vs Juventus, Italian Serie A 2018-19 Football Match? Juventus will have it easy against SPAL and an eight league title should be achieved by the end of the 90 minutes. But clearly, their priorities lies elsewhere considering there was hardly any doubt about who the winners in Italy would be.